Once you start thinking in terms of metaphors for learning, you find them everywhere. At the beginning of this year Mariana Funes, Frances Bell and I had a paper published about the use of the rhizome as a metaphor for learning. Our research findings were that this can be a problematic metaphor for learning, depending on how it is understood and interpreted. 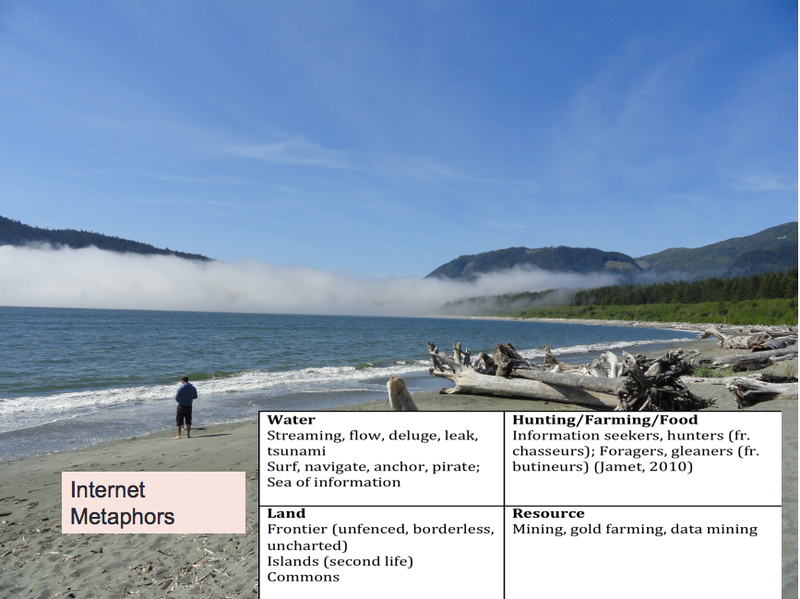 Then at the Networked Learning Conference in Lancaster last month, Caroline Haythornthwaite suggested that we need new metaphors for networked learning. She went through the many metaphors that are already used. I blogged about this at the time, but here is her presentation again from which these two images/slides below are taken. This week, or maybe it was last week, I noted on Twitter that Thomas Ryberg, one of the organisers of the Networked Learning Conference, used patchworking as a metaphor for learning in his PhD dissertation and Frances Bell has often written of knitting as a metaphor for learning and tweeted a link to her blog post. 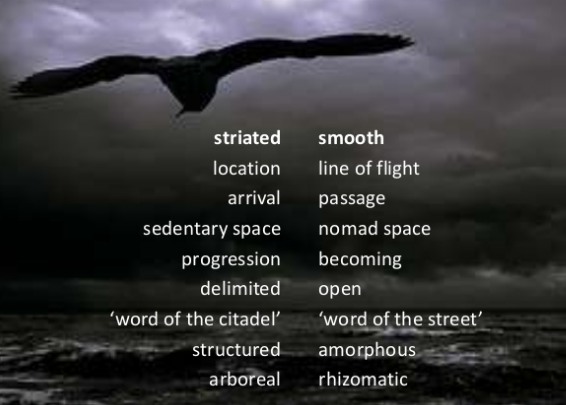 Donna Lanclos added to this discussion by tweeting a link to an article by Katie Collins who writes about needlecraft metaphors for academic writing. The Materiality of Research: Woven into the Fabric of the Text: Subversive material metaphors in academic writing. Also at the Networked Learning Conference, Sian Bayne asked us to think about learning in terms of space. 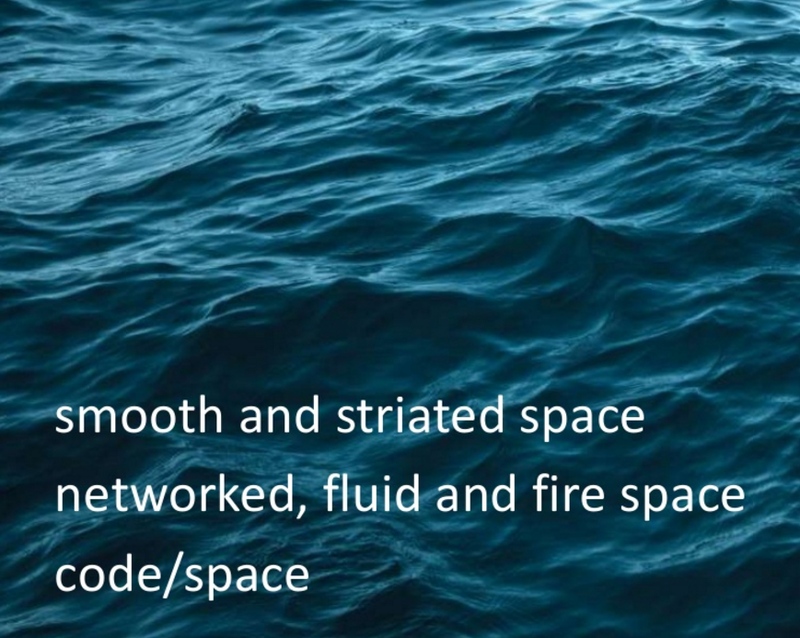 Although she didn’t use the word metaphor, there were plenty of them in her keynote, smooth and striated space, fluid and fire space, code/space. I blogged about this at the time too. I have recognised space as a metaphor for learning before, when I visited the Sensing Spaces exhibition at the Royal Academy in 2014. At the time I felt we could learn a lot from how architects think about space. 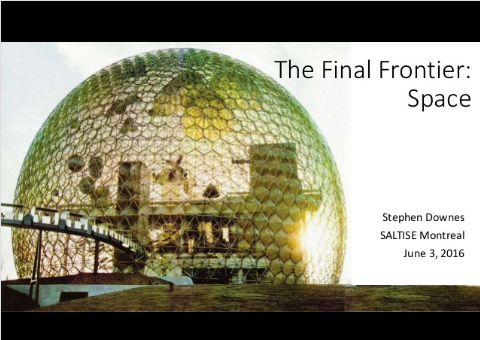 This week Stephen Downes has used the metaphors of time and space to talk about how we might perceive changes in learning brought about by the internet, digital and connected learning. This was an interesting talk. Stephen pointed out that our education system is geared to linear, time-oriented, objectives and outcomes driven ways of thinking and learning. 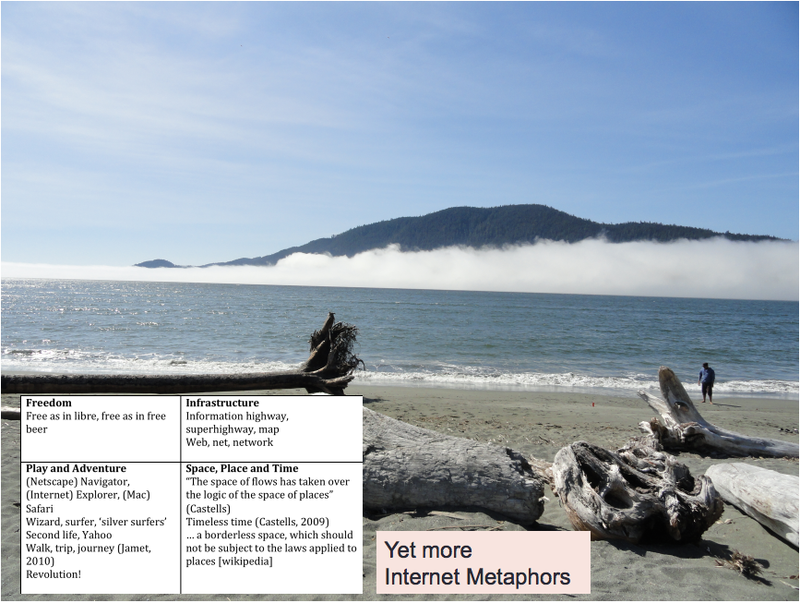 He suggested that space metaphors might be more appropriate for learning in a digital age, referring us to Carrie Paechter’s metaphors of space in educational theory and practice. 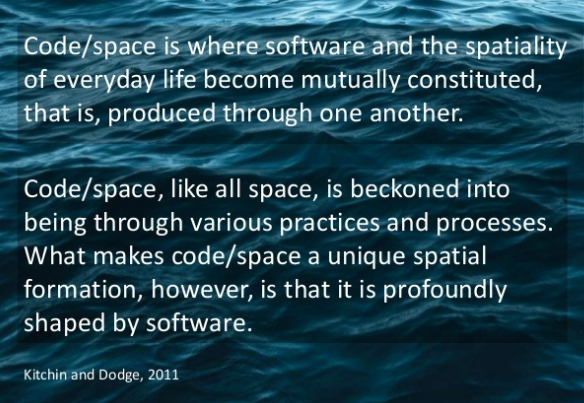 The space metaphor aligns well with my own interest in emergent learning and viewing learning environments as being on a spectrum between prescribed and emergent learning. I can also see connections to Nick Sousanis’ and Ian McGilchrist’s work. The book is about the narrowness and flatness of our vision and thereby of our understanding of the world around us. It is a plea for seeing beyond the boundaries of our current frames of reference, beyond the limitations of text, beyond the borders of the ‘flatlands’. It is a plea to imagine otherwise, to find different perspectives and new ways of seeing. Ironically this week Nick Sousanis reported that a library in France couldn’t categorise his book. This is another example of the dominance of linear thinking which want to fix ideas into ordered categories. Matthias Melcher has developed a think tool for overcoming this categorisation problem where an idea/object must be allocated to just one category. In his tool it is possible to assign an idea to multiple categories. He explains how it works in this video and I have described how I have used it in another blog post. Ian McGilchrist is also concerned with the narrowness or in Sousanis’ terms ‘flatness’ of our thinking. He puts this down to attentional asymmetry of the hemispheres of the brain and the dominance of the left hemisphere, which focuses attention, unlike the right hemisphere which sees the whole picture. In August I will be attending a 4-day course in which I am hoping to learn more about Ian McGilchrist’s views about the relationship between these different ways of thinking and the future of education. I know his next book will be about education and will have the Title – The Porcupine is a Monkey. Like Stephen Downes, Caroline Haythornthwaite, Sian Bayne and Nick Sousanis, Ian McGilchrist writes about the need for new ways of thinking. 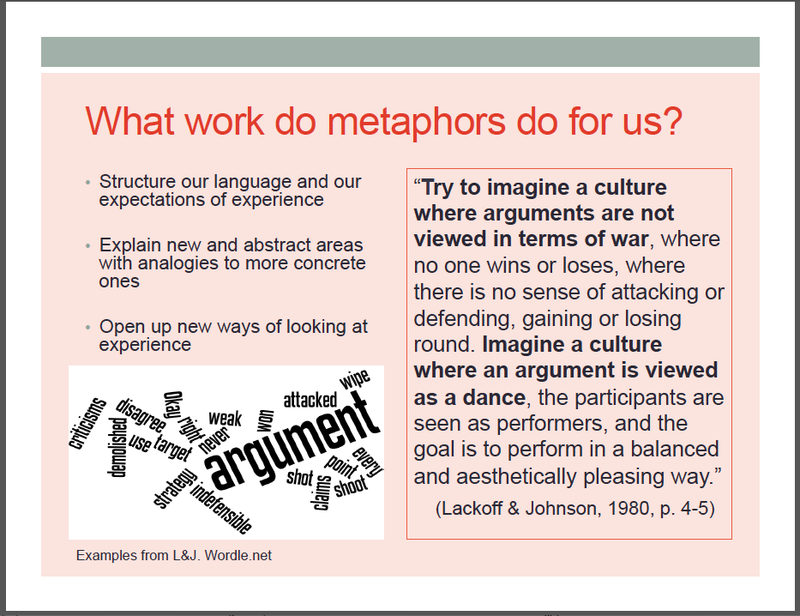 Thinking in terms of metaphors seems an interesting way forward.